Published in the South Kent Gazette, 6 May, 1981. Hitherto the only road access had been through Old Park, or by the ancient road known as Green Lane, which continued over the lower railway bridge on Whitfield Avenue, and passed below Ottawa Crescent up the hill, eventually wandering to the roundabout where it joined Whitfield and Old Park hills, near the site of the present A2 roundabout. The closure of Old Park by the military involved the sole use of this narrow, dark and treacherous road, and in the development of the Estate a new road of considerable width, known as Melbourne Avenue, was constructed. Originally a short length only, it was extended above the present infants’ school to merge with and to widen the top end of Green Lane, the lower part of which was subsequently closed to vehicles. The naming of the roads followed a certain, though not definitive pattern. Those on the River side were named after characters in the Canterbury Tales, and were based around Pilgrims’ Way. The central portion around the Linces became a sort of “poets’ corner“ (Marlowe, Bryden, Byron, Milton, Sheridan), whilst of the remainder much was devoted to -portions of the British Commonwealth or of America. The central part was largely complete toy the late 1940s; much of the 'housing around Melbourne Avenue was built at this time and infilled later. The Hobart area was built, in a very different style, in the ’50s. A new area, around the top of Melbourne Avenue, and near to Archers Court, was commenced in the ’60s. The ’70s saw the replacement of the prefabs in “America“ (the area between Winant Way and Roosevelt Road), while 1980 saw the building of a new-style complex on the lower side of Selkirk Road. Though many amenities were proposed in outline plans, few materialised, giving the impression of an area cut off from the rest of the town. Shopping has been restricted from what was once a series of huts at the bottom of the Linces (a word which means links or fields), to the present crescent in Sheridan Road; there is but one shop for the whole of the upper (Rokesley Road) area. The original public house, the Wheelwright’s Arms, used to be at what is now 29-31 Dryden Road, the present building being built in 1958. Other amenities have included the building of homes for the elderly in Wellington Gardens, Maine Close and Winant Way, and the provision of sheltered housing in the construction of Roly Eckhoff House which has a resident warden. Warden facilities are also promised for Wellington Gardens, combined with the other residences. The older houses on the estate consist either of short terraces of four, or of semi-detached residences, and many of those built before 1960 are of the same type, with quite large gardens. Those built after that period, while often possessing smaller and more convenient gardens, are of a very monochrome style of architecture. Although the same cannot be said of the very recent ones, difficulty of access by vehicular traffic, together with restrictions in the size of living quarters, makes it difficult for some observers to see in the newer type of house any advantages over the older ones. Nevertheless, the laying out of much of the Linces area as playgrounds and mown fields, gives an open and pleasant contrast to many areas of the same date. The estate lay partially in the ecclesiastical parish of River, the post-war housing being situate in that of Buck-land. For the purposes of pastoral care, a new conventional district was formed the first Anglican services being held on 1st November, 1947, in the dining room of 24 Dryden Road, which still serves as a Vicarage house for the parish. The congregation numbered five, the collection being 5s 4d. Father Edward Lueock was appointed the first minister of the district, and a church, suitably prefabricated, was dedicated under the style of St Nicholas, Buckland Valley, by the Bishop of Dover in June, 1948. This structure still exists as a parish hall and for many years served both purposes. After many years’ hard work, the new St Nicholas Church was constructed in the Linces and dedicated by the Archbishop of Canterbury, on 27th May, 1960. Much of the money was obtained by the sale of the site of the war-damaged St Barnabas’ Church, in Barton Road, and the high altar and communion plate are among the furnishings brought from there. The church, as attractive within as it is austere outside, was designed by Mr Harold Anderson, FRIBA, and consists of nave, chancel, eastern lobbies (one of which is designed to hold an organ), west narthex, vestry, chapel, porch and bell-turret, in which is a bell of 1701 from the disused church at Ham. In 1974, the Queen in Council authorised the creation of a new parish, roughly on the lines of the old district, formed from a part of the parishes of Buckland and River, and a small part of Temple Ewell, known as The Parish of St Nicholas, Buckland Valley. The Roman Catholic community had hitherto been obliged either to go to the main St Paul’s Church in the town or to the chapel of Kearsney Convent. Through the energies of Father Terence Tanner, then the parish priest of St Paul’s, the new Roman Catholic Church of our Lady of Dover was built in a commanding position at the junction of Roosevelt Road, and was opened in 1960, Father O’Riordan being the first resident priest. Externally, the principal feature is the tall eastern gable opening, containing a wooden cross, a theme taken up internally, by the reredos of the high altar. ’A notable feature is the “crying room“ where children and toddlers can be present at Mass and see everything, and make as much noise as they like without disturbing the main congregation: The parish now extends out beyond Kearsney one way and to St Margaret’s Bay in the other. So far as education is concerned, the first response other than intake in the already established schools in the town, was the building of Powell Primary School — opened in 1949 — in the Linces, at that time the fastest growing area. To the original buildings, many others have since then added. When it became obvious that Powell could not contain the post-war bulge, a second primary school, Melbourne, was opened in 1954 in the avenue of that name. But by far the largest school is Archers Court Secondary School, built at the top of the hill, serving not only the estate but the fast-growing village of Whitfield and the outlying hamlets towards Deal as well. The present greatly expanded school has a capacity for over 1,000 pupils compared with about 600 when it was first built in 1957. Particularly valued amenities at Archers Court School include its fine 'hall and the recently developed youth centre there. The Mill lands of Buckland are mentioned in the Domesday Survey. These lands lie on the north-east side of the London Road, known anciently by the general name of Mill Lands, also as Brox-Ditch Meadow, and, later, corrupted to Brook-Ditch Meadow. The last corn mill to keep up the busy hum of industry here was the flourishing mill of Messrs W. and E. Mannering; but that structure, now only a store, although it is about 170 years old, occupies but the modem margin of Mill land history. A much older mill, and, doubtless, the representative of the one that existed at the time of the Norman Survey, was on the other side of the stream. There is reason to believe that the original Norman foundations were still embedded in the ancient masonry which formed the base of the wooden superstructure of this mill which, early in the 19th century, was a paper mill, and, about 130 years ago, was converted into Harding’s Wellington Brewery. Two contrasting photographs taken about 70 years apart, demonstrate dramatically the major changes which have taken place at Buckland as the paper mill has grown and extended across the Crabble Meadows shown in the picture above, which is believed to date back about-100 years. Crossing the centre of this picture is a footpath which was used by the occupants of the mill house, on Crabble Hill, to get to the church, just visible on the right, for Sunday services. Sheep, which grazed in the meadow beyond the path, as illustrated in Part 178 of this reprint, could not, it seems, cross the river and stray into the mill house garden, because the wooden bridge across the Dour had a drawbridge arrangement. Off Crabble Hill, on the left of picture above are the grounds of the Coleman Nurses’ home, which is just out of view. On the lower corner of this site British Legion flats have recently been built and beyond them is a petrol filling station. The aerial view of Buckland Church and churchyard and the adjoining Buckland Paper Mill taken about 30 years ago. 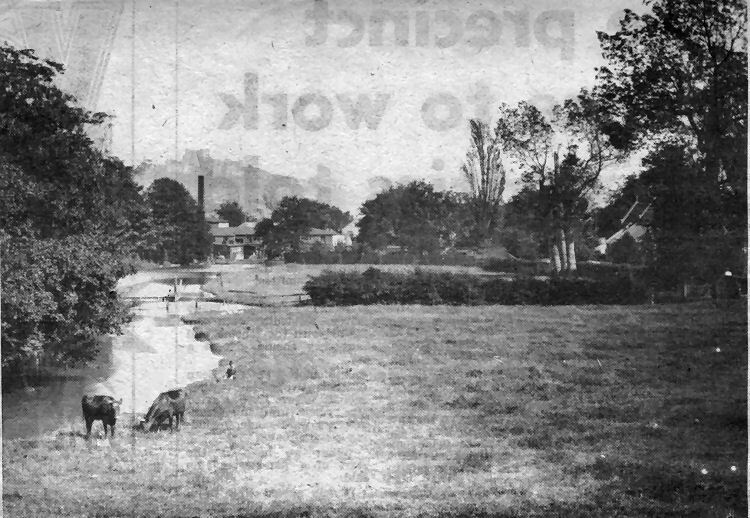 In the top left corner of the picture are the grounds of the Coleman Nursing home where British Legion flats were recently built.